He runs a not-for-profit social welfare project that is a direct spin off from the Himalayan Rocket Stove prototyping and testing process. It natural for us to want to give something back to the earth and conserve it with our best efforts we can. While the Indian government has been running small-scale practical projects in the Himalayan and Leh valley to make life sustainable there by providing basic resources such as fresh water and sustainable wood supplies, supporting children's educational needs and helping communities preserve or improve their environment whilst giving the maximum possible long-term economic benefits etc; there are people like Russell Collins who feel closely connected to the cause as well. I met Russell Collins in Chandigarh a few weeks ago, where he has his testing and design development workshop for his rocket-stove project in India. He runs a not-for-profit social welfare project that is a direct spin off from the Himalayan Rocket Stove prototyping and testing process. In the course of testing materials in Ladakh, he found an incredibly cheap and effective way to make smokeless cook stoves (chulhas) suitable for villagers around the world who still use open fire or rudimentary stoves inside their homes for cooking. The concept of rocket stove pushed Russell to do some digging in his spare time. Soon his interest later became an obsession and Russell ended up building a prototype of rocket stove in Manali two years ago. 3. A Large Space Heater is also in test mode in Ladakh. This is a taller unit designed for heating halls, schools, monasteries and large homes. 4. More designs are in development, with many variations possible to suit a wide range of situations. The next step was to make a stove that serves multiple purposes — heating a room, providing a suitable cooking surface, and temperatures, heating water and charging a phone from a USB port powered by current generated by the tech built into the stove. The stove will be sold at around Rs 15,000 for the smaller unit and Rs 20,000 for the unit equipped with the hot water box. The large space heater they are working on will be priced around Rs 30,000. According to Russell, the product will be ready for sale this September. What lured Russell, an Australian, to spend so many years in the Himalayas? Russell, 46 now, first traveled to India to visit Kinnaur and Spiti Valley when he was but 22. His experience with the village community compelled him to return to these regions multiple times, eventually becoming involved in various non-profit programmes in Tabo, a small town in the Lahaul and Spiti district on the banks of the Spiti river in Himachal Pradesh. He then self-funded an eco-house development programme in the village and simultaneously started organising sponsorship for Serkong School in 2003 to provide quality education to the children of Spiti. 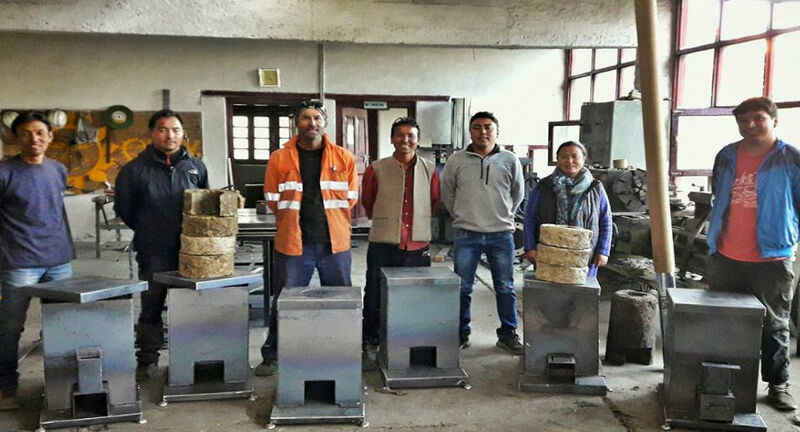 While he self-funded the early stage of prototyping his rocket stove, money came in from someone he had met in Kinnaur Valley in 2003 whilst being stuck in a landslide. They had stayed in touch long after. Russell is in the process of setting up a private limited company in Chandigarh with initial production to start from a factory based in Baddi, an industrial town just across the border, in Himachal Pradesh. Russell and his production manager are the only permanent employees, while the manufacturing partners have approximately 100 employees. 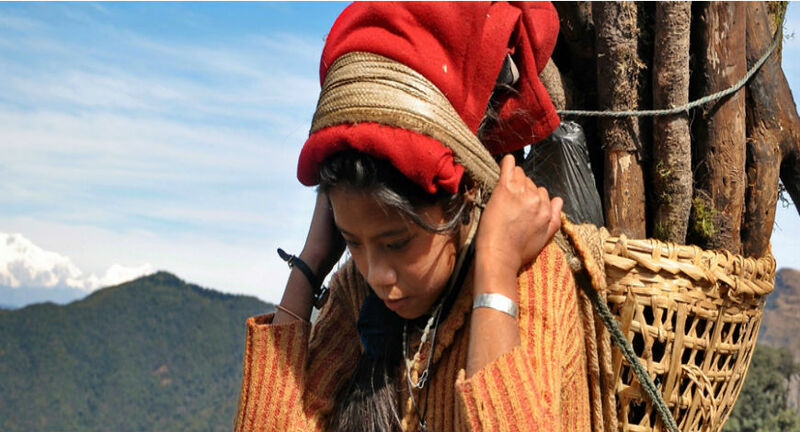 The Himalayan Rocket Stove’s efficiency is such that for each stove in use in a typical family home in the Himalayas, one mature tree’s worth of timber is saved each year. This in turn saves on average 100 heavy loads on a woman’s back and 3.5 tons of CO2 from being released into the atmosphere. The mission of HRS is to save 1 million trees by 2026. They aim to tie up with various independent 3rd party agencies who are able to quantify and verify these benefits. One of our large space heaters is 36 inches high and uses a scaled up internal design accordingly, and is very effectively heating a hall in Ladakh with only a small increase in the fuel input. We will look at producing more of these in the coming year, as the feedback has been great with lots of people also wanting these heaters for larger spaces. The smokeless chulha is targeted exclusively at those who would normally use an open fire or a rudimentary chulha that does not vent to the outside. Basically, this is an improvement on something that vents smoke into the house. It is not designed to replace something that already vents to the outside. This is typically the lowest economic strata.